Earlier this year, an engineer who goes by the name of BTE Dan, proposed building a full-sized, ion-powered version of a Constitution-Class Enterprise — from Star Trek — saying it could be built with current technology and could be completed within 20 years. Now, BTE Dan has started a White House petition — not to build the Enterprise — but to just do a feasibility study and conceptual design of the USS Enterprise interplanetary spaceship. As of this writing, the petition has 1,414 signatures of the 25,000 needed by January 21, 2013 to be considered by the Obama administration. 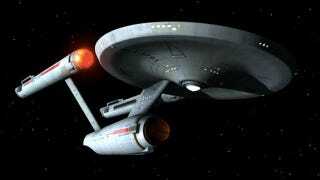 We have within our technological reach the ability to build the 1st generation of the USS Enterprise. It ends up that this ship's inspiring form is quite functional. This will be Earth's first gigawatt-class interplanetary spaceship with artificial gravity. The ship can serve as a spaceship, space station, and space port all in one. In total, one thousand crew members & visitors can be on board at once. Few things could collectively inspire people on Earth more than seeing the Enterprise being built in space. And the ship could go on amazing missions, like taking the first humans to Mars while taking along a large load of base-building equipment for constructing the first permanent base there. BTE Dan told Universe Today earlier this year that what he really is hoping for is to find a segment of scientists and engineers in the space industry to take an active interest and contribute to the ideas on his website, BuildTheEnterprise.org to help move the concept forward. "I have been getting many offers of help from engineers outside the space industry, and that's great," he said via email. "But also what is needed are some experienced space engineers who adopt a can do attitude about the concept of the Gen1 Enterprise." BTE Dan prefers to remain anonymous at this point, and his biggest concern has been that the scientists and engineers at NASA, and their space contractors were going to be hostile about the idea, as his first brush with them did not go well. "I am an outsider poking around in their sandbox, and human nature is that people don't like that," he said, noting that he knows his design may have fatal flaws, but that is why he is looking for assistance. "There is a lot of waste heat to get rid of, today's ion propulsions engines need major advances, and perhaps stability problems will be found with the gravity wheel," he said. When Universe Today broke the story of the BuildTheEnterprise concept in May of this year, it went viral and BTE Dan's website crashed under the traffic. "I really did not expect this at all," he said at the time. "I did not plan for this level of web traffic!" His website is complete with conceptual designs, ship specs, a funding schedule, and almost every other imaginable detail of how the Enterprise could be built. It would be built entirely in space, have a rotating gravity section inside of the saucer, and be similar in size with the same look as the USS Enterprise that we know from Star Trek. The White House takes petitions on many topics at the "We the People" website and will consider them if they receive 25,000 signatures. Earlier this year, a petition to build a Death Star space station by 2016 received over 32,000 signatures, but so far there has not been an official response about it from the White House.